Story Contracting staff have been busy raising vital funds for charity partners Mind and SAMH – with around £6,500 raised so far. Story, along with sister company Story Homes, has pledged to support the two mental health charities over two years and to coincide with World Mental Health Day, wanted to highlight they vital work they carry out. The company has been helping to transform The Lighthouse in Carlisle, which offers support to people in times of crisis, with the official launch of the major refurbishment set to take place on November 7. Story has invested time, labour and materials to revamp The Lighthouse and has been supported by local firms JT Atkinson, Thomas Graham, A&W Irving Painters and Decorators, Dumfries Timber, JD Pipes, John Richardson Timber and More Handles. More projects are also planned in the coming months in Manchester, Leeds and Glasgow where the company has offices. Fred Story, who owns both businesses, said: “We want our staff, sub-contractors and suppliers to know that support is there should they need it and we also want to help people in the areas where we work. 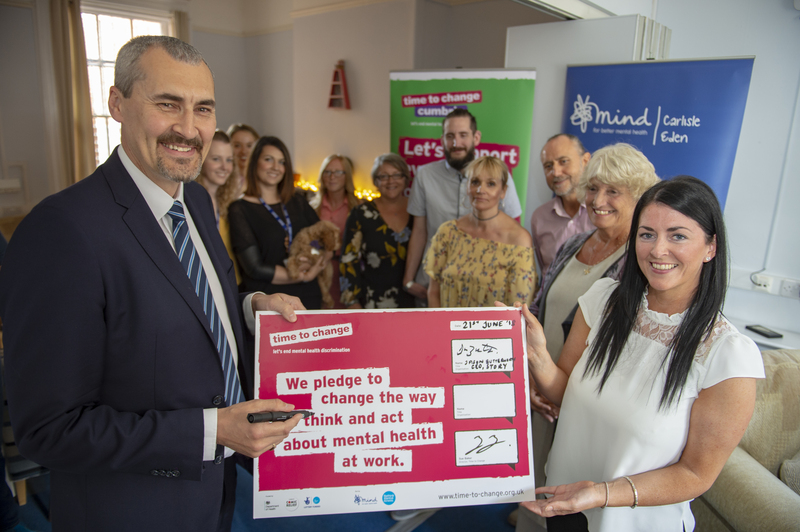 Tara Quinn, chief executive officer at Carlisle Eden Mind, said: “We are delighted that Story Homes and Story Contracting have made such a massive and long-term commitment to supporting people experiencing difficult mental health issues in this local community. World Mental Health Day is observed on October 10 every year, with the objective of raising awareness of mental health issues around the world. Five Ferries Cycle Challenge: Craig Lafferty, Eddie Esdale, John MacArthur, Dave Gardiner and Serge Gomez completed the ride on the west coast of Scotland, cycling 75 miles, taking on 1,500 metres of gruelling hills and catching five ferries on the way. Around £500 was raised for SAMH. Football: Contracting v Homes. Contracting twice fought back from a goal down with the annual charity match at Carlisle United’s Brunton Park ending 2-2… with Contracting taking it 4-3 in the penalty shootout. The match raised £800. Pedal Scotland: David Kellighan, Gary Brown and Richard Hensman took on the challenge of cycling 45 miles from Glasgow to Edinburgh in aid of SAMH. £1,150 was raised. 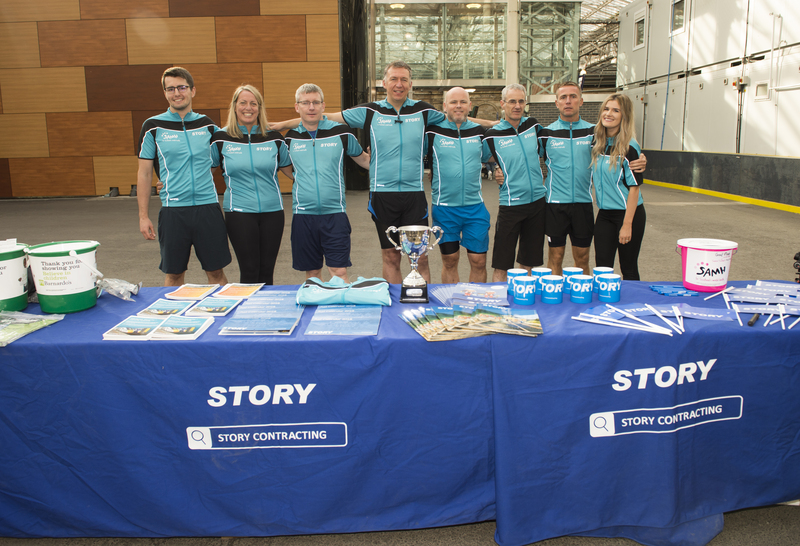 Waverley Cycle Challenge: £800 was raised when a Story Contracting team took on one from Network Rail and raced the 45-mile distance between the station and Glasgow Queen Street on static bikes. Chairman’s Golf Day: Contracting beat Homes 10-8 on the day but the real winner was Mind with £1,600 raised through a raffle, auction and holes being sponsored. Free Your Mind days, including a special World-Cup themed day, in which staff wear their own clothes on the last Friday of every month and pay a minimum donation of £2, have so far raised hundreds of pounds. Further fundraisers are also planned, with the latest being a charity row at Botcherby Community Centre in Carlisle on Saturday, October 20 with a target of £1,000. Staff in Story’s Normanton office near Leeds are also planning to cycle between the charity’s bases in Carlisle and Leeds to support a project in West Yorkshire.